the budget cuts come as solar policy is in turmoil, as feed-in-tariffs, introduced over the past few years to support the installation of rooftop solar, are set to be wound back or abolished. 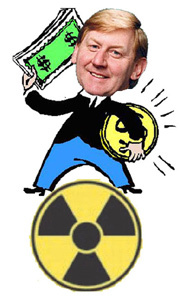 Spending, like meters, goes backwards and forwards, Sydney Morning Herald, Paddy Manning, May 14, 2011 The budget was dismal for the renewable energy industry and the Energy Minister just doesn’t get it. MORE proof ricocheted through Twitter this week that federal Energy Minister Martin Ferguson doesn’t ”get” renewables. Well, gas is not clean energy and renewables offer a clear alternative to coal-fired power. Such a dismissive remark coming from the top – even as the UN’s Intergovernmental Panel on Climate Change forecasts that renewables could provide up to 77 per cent of our energy by 2050 – rubbed salt into the wounds of a sector that suffered hundreds of millions of dollars in budget cuts or spending deferrals this week to programs like solar flagships, solar schools, the renewable energy venture-capital fund and the connecting renewables program…….. Solar energy advocates in particular are dismayed because the budget cuts come as solar policy is in turmoil, as feed-in-tariffs, introduced over the past few years to support the installation of rooftop solar, are set to be wound back or abolished. The perception has been created – and reflected occasionally in this column – that feed-in-tariffs are a form of middle-class welfare…..
It’s not so simple, however. The Clean Energy Council last week published figures showing higher rates of take-up in rural and regional Australia, much less than in the latte belts of Sydney and Melbourne, and this was backed up by income distribution data. Meanwhile, relentlessly, the price of solar PV continues to fall – ”grid parity” will be when rooftop solar costs the same or less than electricity from a retailer and is coming as soon as 2014.
n some cities we’re there already, according to ANU professor Andrew Blakers, who calculated the year in which parity is reached in every capital using the price of small-scale renewable energy certificates, the retail electricity price, available sun, system cost and other factors.